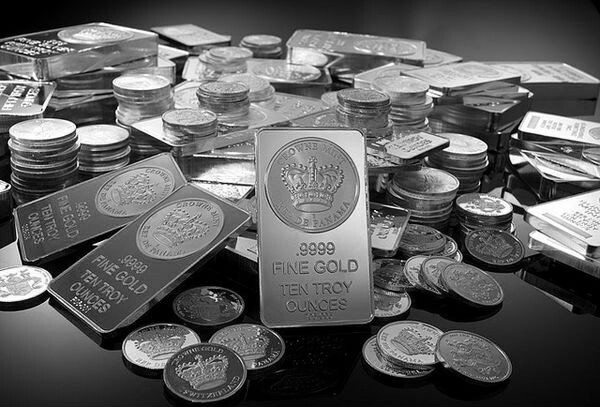 Precious Metals Definition: Metals are classified as precious because they are considered to be rare or have a high economic value. The relative value of these metals depends on their rarity, use in industry and use as an investment. The four top precious metals of interest to investors are silver, gold, platinum and palladium. Each of these metals have their own price indicators and correlations. The price of silver is correlated closely with gold. In other words, if gold goes up or down silver is probably doing the same. Silver has a negative correlation with the Dollar or any currency for that matter. In other words, if the Dollar increases in value silver's price in dollars decreases, if the value of the Dollar decreases silver's price in dollars increases - generally speaking. One of the major influences of silver's price is the futures market. The silver market is fairly small and it's price easily sways in the wind of large players in the silver futures market. Silver has the highest electrical conductivity of any element. Silver has highest thermal conductivity of any metal. Silver has one of the highest levels of optical reflectiveness of all metals. Silver is used industrially in electrical appliances, medical products, bearings, electrical connections, batteries, superconductor applications and more. Silver is also in demand as an investment and store of wealth. Up to 75 percent of the silver coming from mining is a by product of mining other metals. Only 25% or so comes from actual silver ore. Scrap silver is recycled back into the market when it is economical. This includes jewelry, photographic chemicals, and discarded computers. The price of gold is correlated closely with silver. In other words, if silver is going up or down gold is probably doing the same. Gold has a negative correlation with the Dollar or any currency for that matter. In other words, if the Dollar increases in value gold's price in Dollars decreases, if the value of the Dollar decreases gold's price in dollars increases - generally speaking. Gold is malleable and conducts heat and electricity very well. Industrially, gold is mostly a base for jewelry, although it does have some applications in electronics. Gold prices seem to be more closely correlated with peoples' sentiment than the laws af supply and demand. When sentiment is low, owners sell gold. The price goes down. When sentiment is high, investors buy gold. The price goes up. Investors buy gold because of financial system concerns. When the stability of banks is in question gold is perceived as a safer store of wealth than currency. During times of expected inflation people will buy gold to preserve their wealth. Often, money printing (creation of money out of thin air) by governments cause money to become less valuable. As a result, it takes more money to buy gold - gold's price goes up. During expected political upheaval or war people will buy gold to preserve or transport their wealth. They know gold will still have its value even after the political upheaval or war is over. The money of the countries involved may not. Like other precious metals, platinum's price tends to go down as the perceived value of the dollar goes up - and visa versa. Platinum is considered to be an industrial metal. The greatest demand for platinum comes from automotive catalytic converters. Platinum is hypo-allergenic and therefore it is also very popular in jewelry (my wedding ring is part platinum). Because of its wide spread use in the automotive industry, platinum prices are determined in large part by auto sales and production numbers. Most of the platinum mining is done in South Africa and Russia. Mining labor issues and political ramifications could make platinum's price very volatile. Platinum is one of the rarest precious metals. Only a couple hundred tonnes are produced annually. In contrast, annual gold production is in the neighborhood of 1800 tonnes per year. To give you an idea of how rare platinum is, only about 25 cubic feet of platinum has EVER BEEN MINED! It takes ten tons of ore and a several month process to get one ounce of platinum bullion. Palladium is not the rarest of the precious metals, but it is rarer than platinum and is still relatively unknown worldwide. There are very few economically justifiable deposits of palladium. The most extensive deposits are located in South Africa and Russia. Palladium has properties and uses similar to platinum because they both belong to the same grouping of metals in the periodic table of elements - the platinum group. Palladium is used in jewelery, electronics, medical instruments and catalytic converters in most vehicles, but it is mainly used in catalytic converters on gasoline-powered vehicles. Palladium is substantially less expensive than platinum. Precious Metals Mutual Funds - Reasons for choosing and investing in precious metals mutual funds. Gold vs. Silver - How do you choose which metal to invest in?